This big handsome boy is Neo, an 18 month old Staffordshire Bull Terrier who is looking for a new home urgently as his Dad has to move abroad for his job. 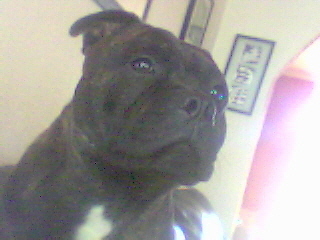 Neo is a large and stocky boy, dark brindle in colour with a white chest patch. He is currently living in the Blackpool area. Although not currently neutered this will be part of the adoption agreement to be carried out once in his new home. Due to the time constraint on rehoming we have not personally assessed Neo, and the information below is provided by the owner, who is happy to work with us through the adoption application process and introductions. Neo does not live with children but has regular contact with youngsters. He adores them, and is a big softie around them. He is gentle with them, enjoying cuddles and attention, but also playful. As with all dogs common sense should be used. Neo is living with 3 cats and sees them as play friends, and a new home with dog tolerant cats is possible. Neo is quite a dominant dog and likes to assert this by pinning a cat or dog on the floor when play-fighting. We would therefore suggest that homing with another dog would be best with a submissive female. Neo has the ability to jump, and fencing MUST be a minimum of 5 foot all round. 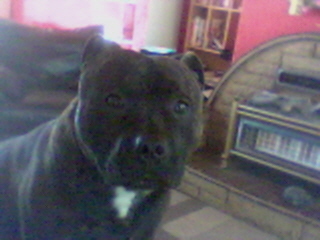 Neo is house-trained and not destructive, except with his toys as all Staffie's tend to be. He is not nervous of anything, including fireworks. Neo loves training and learning and is very responsive. He knows a few commands already including sit, stay, lie down etc, but would enjoy learning more as he likes to please his owner and to know he has done well. Being a strong dog he does pull on lead, so lead walking needs further work, but once a bond is developed and he is allowed off lead he has very good recall. However, off lead walks need to be supervised for his own benefit as not all dogs will tolerate his dominant playfulness. Neo loves travelling in the car, and at night sleeps in a crate in the living room. He is currently fed a mix of tinned and dry food twice a day and has no known medical problems. Being an active and playful boy, Neo loves his toys, but he is happiest when he's close to his owner and getting fuss. He is very people focussed and likes to spend as much time with you as possible. Neo's owner describes him as a wonderful big softie of a dog, who is chilled, obedient and very affectionate. The owner is reluctantly having to rehome Neo, but as he leaves the country at the end of April he is keen to find the best home for Neo before that date to avoid the need to kennel him. Anyone interested in rehoming Neo needs to contact us or telephone Clare on 07929 478634 for an informal chat.